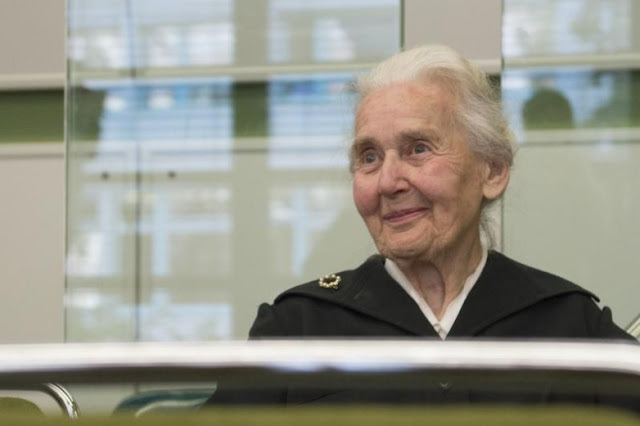 FILE PHOTO - Ursula Haverbeck, accused of denying the holocaust, sits in a courtroom in Berlin, Germany, October 16, 2017. BERLIN - A German court sentenced an 88-year-old woman to six months in prison on Monday for denying the Holocaust and for inciting hatred. Ursula Haverbeck, who describes herself as a revisionist historian, said at a public event in January 2016 that gas chambers in Auschwitz concentration camp “were not real”. A court in Berlin found Haverbeck guilty after examining a short video of her speech in which she said that she was citing a book, not expressing her own views. The court, however, found the speech to be her own and gave her six months in prison. Denying the Holocaust, in which six million Jews were killed, is a crime in Germany, punishable by up to five years in prison. Haverbeck, who is avoiding going to jail by appealing the verdict, has faced similar legal cases across Germany. The latest was by a court in North Rhine-Westphalia last summer when she was given a 10-month prison sentence for the same charges. A German court sentenced an 88-year-old woman to six months in prison on Monday for denying the Holocaust and for inciting hatred. Ursula Haverbeck, who describes herself as a revisionist historian, said at a public event in January 2016 that gas chambers in Auschwitz concentration camp “were not real”.